As with most events of this kind, the action will be accompanied by plenty of music with an MC and DJ, and there will be a halftime show. A spokesman for organizers Sports Biz says it’s a whole new ball game for Japan. 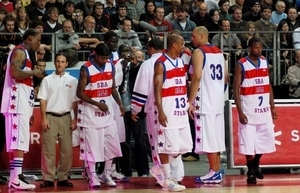 “There have been similar tours of countries in Europe, but as far as I am aware, the mixing of former NBA players and street basketball players is a new format for an event in Japan.” The spokesman says the Japan players are sourced from the many events around the country and that street basketball is becoming popular in Japan, in part because of the dazzling dribbling and dunks, but also because of the music and other activities that are mixed with the sport. Like the NFL, NHL and major leagues, the NBA has also played regular-season games in Japan, and the likes of local stars Yuta Tabuse and Kei Igarashi have helped boost the game here. The basketball boom all started, according to the Sports Biz spokesman, with the legendary Chicago Bulls team of the late 1990s, of which Rodman was a member. That fits Rodman perfectly. While always being a supreme athlete on the court, he was little more than a comic character off-court. He was a five-time NBA champion (twice with the Detroit Pistons, three times with the Bulls) and led the league in rebounds for seven straight years (1992-98). Rodman’s personal life has been one of extreme individuality (tattoos, piercings, freaky hair styles); along the way, he dated Madonna and married Carmen Electra, so he ain’t stupid. But despite dalliances as an actor, DJ and pro wrestler, he’s still a basketball man at heart, and the more flamboyant style of street basketball should suit him perfectly.